A quick view of the most influential metrics in San Diego County. San Diego County, California is located in the southwestern portion of the state. The county spans 4,207 square miles, 319 square miles of which is water covered. There are two main climates in the county, Mediterranean climate and semi-arid climate. The topography of the county is quite varied featuring hills, mesas, canyons, mountains, beaches, Sonoran desert and ocean bluffs. 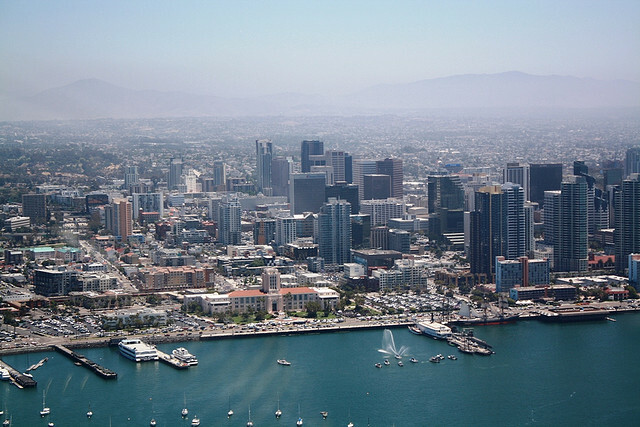 San Diego County is the county seat and is and the second most populated in county the state of California as well as the fifth most populated county in the United States. The county encompasses the San Diego-Carlsbad, CA Metropolitan Statistical Area and is also part of the San Diego-Tijuana metropolitan area. The first known inhabitants of the area were people of the native Kumeyaay, LuiseÃ±o, CupeÃ±o and Cahuilla tribes. Juan Rodriguez, sailing for Spain claimed they bay area for Spain in 1542. Sebastian Vizcaino surveyed the area in 1602 and the first settlements, San Diego Presidio and Mission San Diego de AlcalÃ¡ were established in 1769. After winning their independence from Spain, Mexico controlled the area from 1821 through 1848 and called it Alta California. When the Treaty of Guadalupe Hidalgo ended the Mexican American War in 1848 the lands came under U.S. control. California gained statehood and the county of San Diego was formed both at virtually the same time in February of 1850. According to the United States Census of 2000, the county was home to 2,813,833 people spread across 994,677 households. By the census of 2010 the population had risen to 3,095,313. In 2000, the median household income in the county was $47,067, and the median family income was $53,438. The economy in the county rests on three main legs, agriculture, tourism and military. In addition to the cities and neighborhoods, San Diego county is also home to 18 federally reservations for various tribes of Native Americans. These reservations span a total of 200.2 square miles and include reservations such as the La Jolla Reservation, the Mesa Grande Reservation, the Pauma and Yuima Reservation. The topography of the county is quite varied featuring hills, mesas, canyons, mountains, beaches, Sonoran desert and ocean bluffs. Education is very important in the county of San Diego, in the public school system there are 12 unified school districts, 24 elementary schools, and six high schools. It is also home to five community college districts, three public state universities, and four private universities. Local attractions include LEGOLAND California, USS Midway Museum, San Diego Zoo, San Diego Zoo Safari Park and others. Homes for sale in San Diego County range from small starter homes and fixer uppers up through sprawling luxury properties. Rental options include apartments both individual and within apartment buildings, duplexes and more. Other housing options include upscale apartments, town houses and condominiums with a variety of amenities. Call a local real estate agent for assistance in exploring the area and finding the perfect place to call home. View our selection of available properties in the San Diego County area. Check out the latest demographic information available for San Diego County. Learn more about schools near San Diego County complete with ratings and contact information. Browse through the top rated businesses in the most popular categories San Diego County has to offer.